Mmmm....Double chocolate cupcakes. 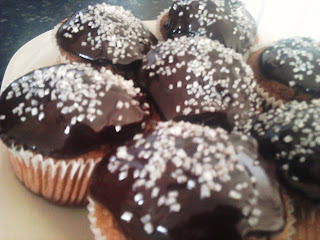 With chocolate fudge topping... Click here to see how I made them (and to hear me blabber about myself a little too.). Amanda, at The Sweet Details has an amazing food blog. I'm always pinning her recipies and so I'm really excited to be posting over there. So if you're in the mood for chocolate check it out.